28-inch 2-Door Garage/Workshop Base Cabinet in Black The Husky 2-door Base Cabinet offers you total durability and maximum storage space. 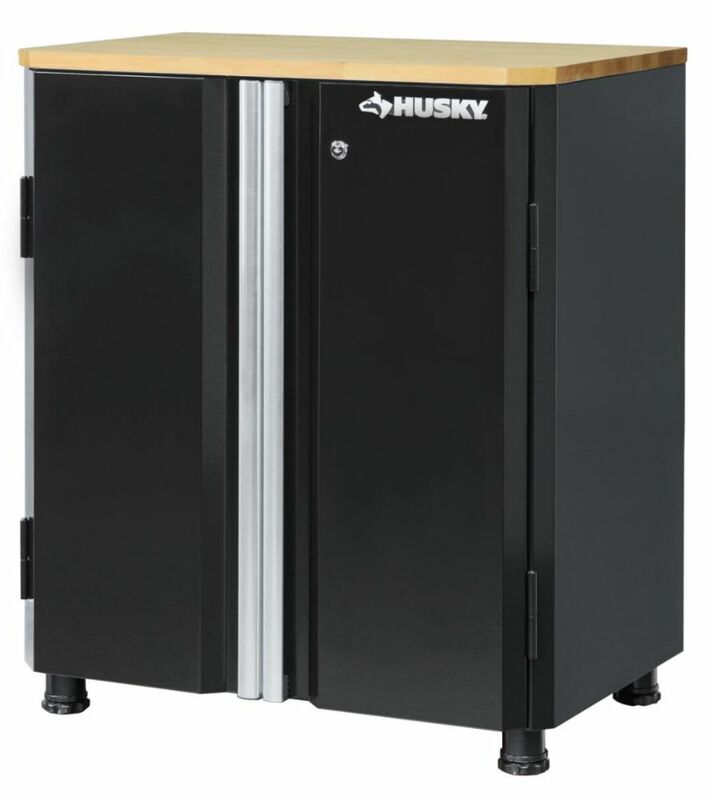 It is also ideal as a freestanding solution or docked under a Husky Workbench. The adjustable shelf inside of the cabinet makes organization easy, and the extremely durable magnetic catch powerfully holds the cabinet doors when closed. 28-inch 2-Door Garage/Workshop Base Cabinet in Black is rated 5.0 out of 5 by 5. Rated 5 out of 5 by Terosaur from Excellent quality I was impressed with the quality of the pieces and how everything fit together perfectly. All pieces were in mint condition. I have no complaints and highly recommend this piece. Rated 5 out of 5 by Vancouver Mo from Outstanding!!!! This workbench cabinet exceeded our expectations, which were high. We bought it online so it arrived in a box in just a couple of days, needing assembly. It was very easy to put together. The materials are higher quality than anything I have purchased in years. It is very strong and attractive. We are getting another to go with it. Highly recommend. Does the 28&quot; 2 door Base cabinet accept casters, it shows on the US site that it does. Thank you. The 28&quot; 2 door Base cabinet can accept casters - casters sold separately. What is the total height of this cabinet *excluding* the legs?